Fresh and light with tons of lime and coconut. Take a ride around the world with this tropical vegetable dish. The Kaffir Lime leaves give an amazing aroma of lime throughout the dish without citrusy bitterness. Finished with heaping handful of cilantro for an ultimate fresh taste. Over the Christmas break, I was back at home perusing cookbooks and found “Plenty More” by the uber famous Yotam Ottolenghi. At first glance I was thoroughly impressed by the images, but felt the ingredients may be too obscure for most. I still grabbed the book and loaded it up for some airplane reading on the way back from Missouri to the Chicago Arctic. Ok, so beans are haricots verts, but when do I find curry leaves, and fresh ones to be exact? Well I haven’t yet… But I did find fresh Kaffir Lime leaves at an asian grocery store for real cheap. So I tossed ’em in! Although I am sure it’s a very different flavor from the original recipe, the aroma and flavor infusion from the leaves is worth a quick trip to the market. I sort of believed her, but I still wore my cut resistant gloves. I dug up an old knife and began gently hacking away at the top point. It’s easy to cut through the white flesh, but then there is a woody center that does take a bit more whacking. Then suddenly the coconut water begins to leak out and whoohoo! Just like finding water in the dessert. 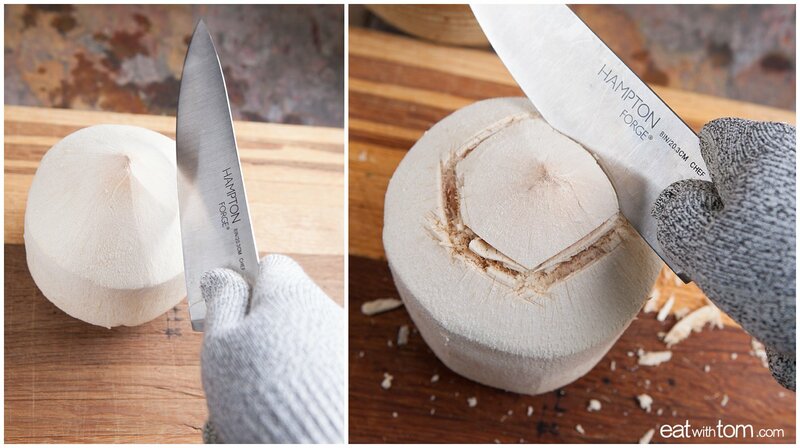 Take a look down below for images of how-to break into the young coconut, it is definitely easier than I would have imagined. 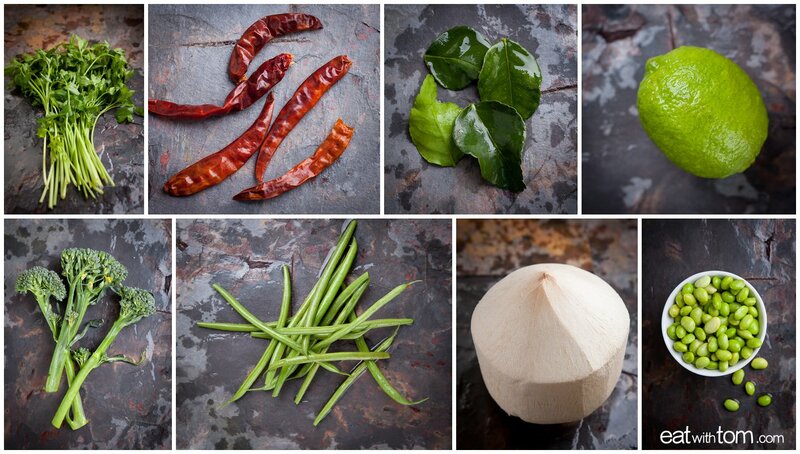 AND the coconut is totally worth it in this veggie dish for a hint of sweetness and richness. This recipe was the my first foray into “Plenty More” and it actually turned out real tasty! Either every recipe in this book is pretty good, or I just got lucky. Regardless, I am motivated to translate more British English to discover the world according to Yotam. 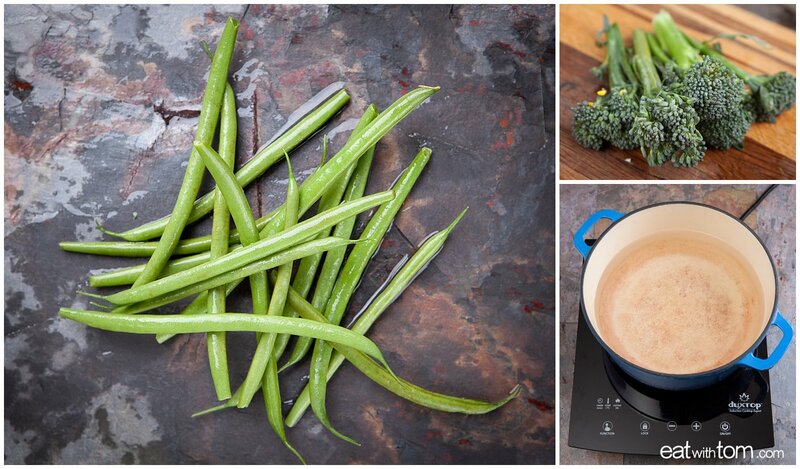 Rinse green beans and broccolini in fresh cold water. Set a large pot of water to boil. Trim the tips off green beans. 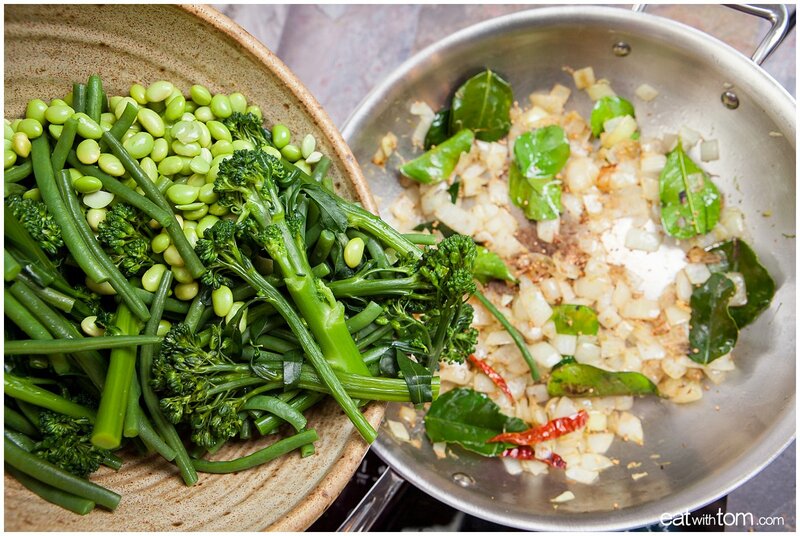 Once water is boiling rapidly, add green beans and broccolini. Set a timer for only 3-4 minutes to blanch. Remove promptly to a colander with a large slotted spoon or tongs. Rinse under cold water to stop the cooking. Set aside in a large bowl. 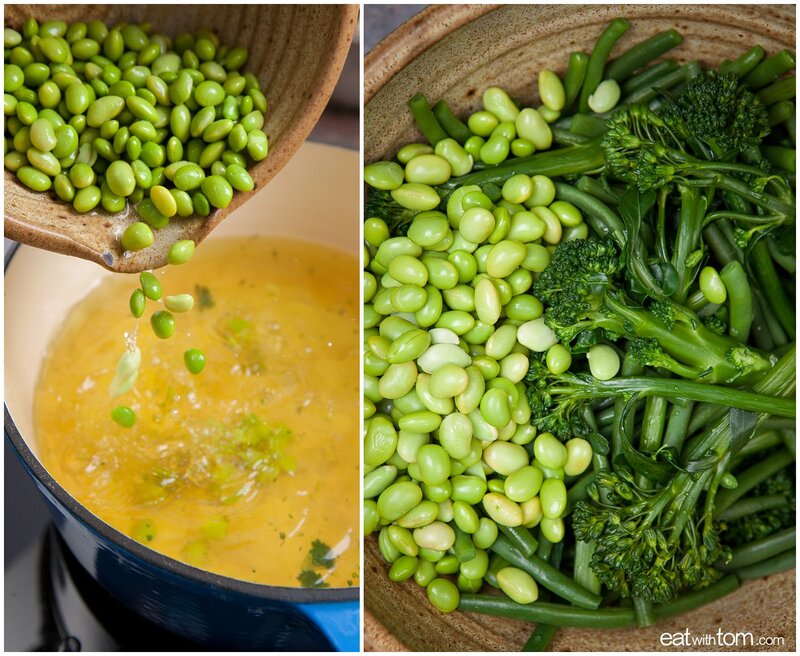 Retain boiling water for edamame. Add edamame and set timer for 2 minutes. Then drain edamame in colander discarding the boiling water. Rinse under cold water. Add to large bowl with broccolini and edamame. Put on cut-resistant gloves. With a large chef’s knife, gently whack the top portion, about 1.5 inches down from the tip. Use moderate force, to chip away at the white flesh until you hit the inner woody center. Work your way around the top making 5-6 cut areas. Once the core cracks, you are almost in, be careful to not lose all of the coconut water. Remove top of coconut. 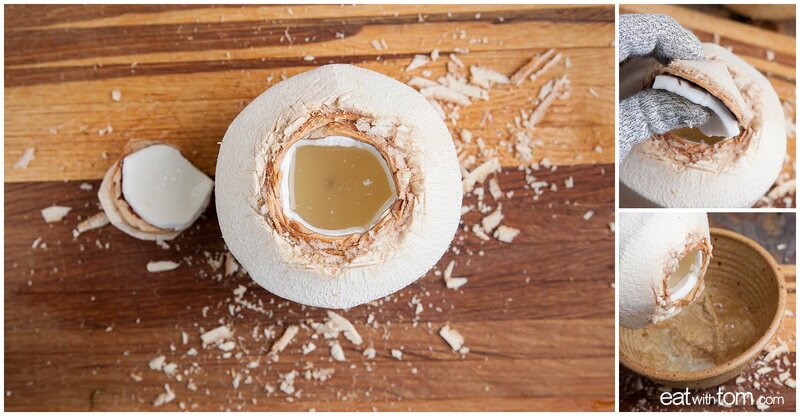 Dump coconut water into a glass and enjoy. 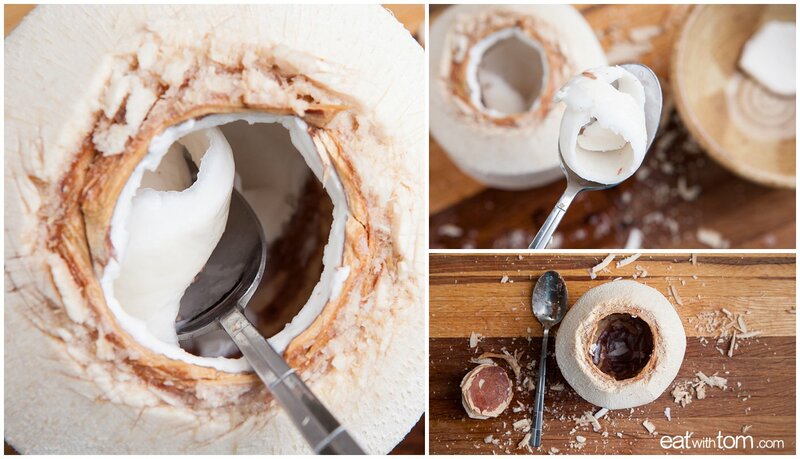 Use a spoon to remove the coconut meat. Roughly chop and set aside. In a large sauté pan, heat 2 tbsp of olive oil over medium heat. 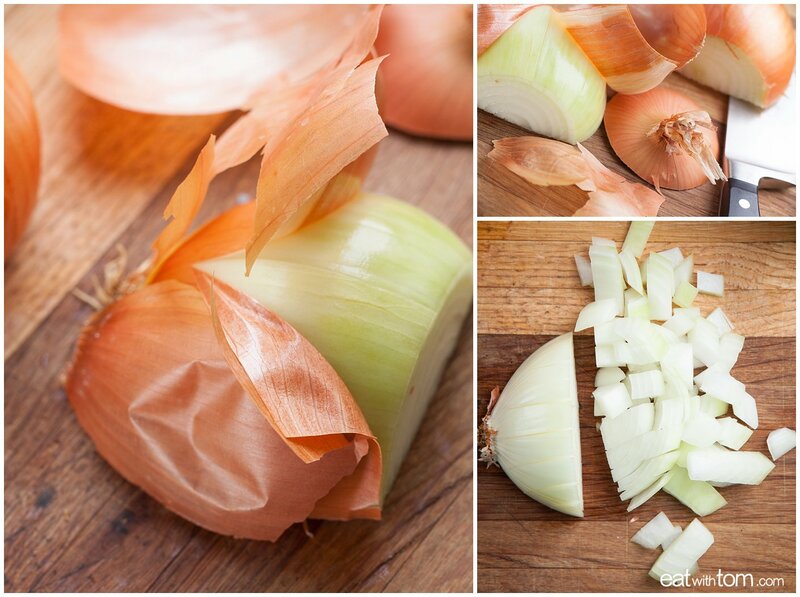 Add onions and cook until soft, about 5 minutes. 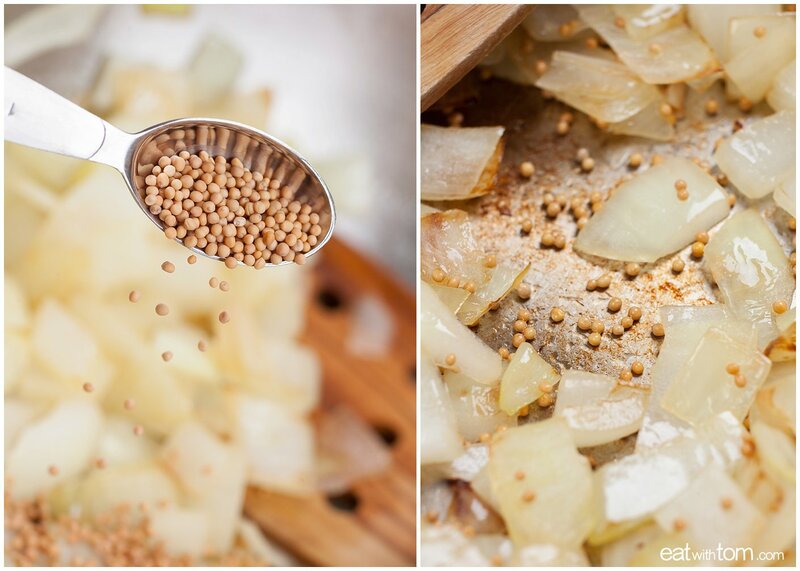 Add the mustard seeds and continue cooking until they begin to pop, or about 2 minutes. The mustard seed will toast and begin to brown slightly. 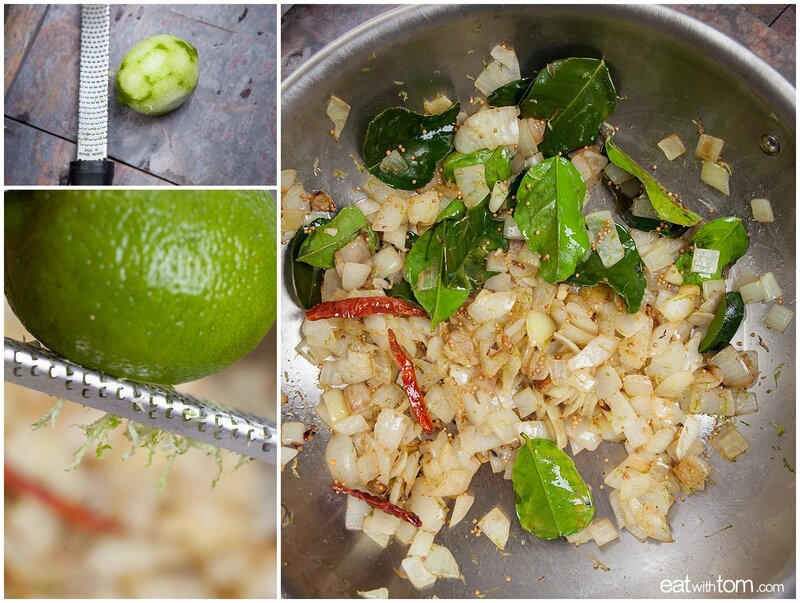 Add Kaffir Lime leaves, bay leaves, chiles and and lime zest. Continue cooking for 2 minutes. 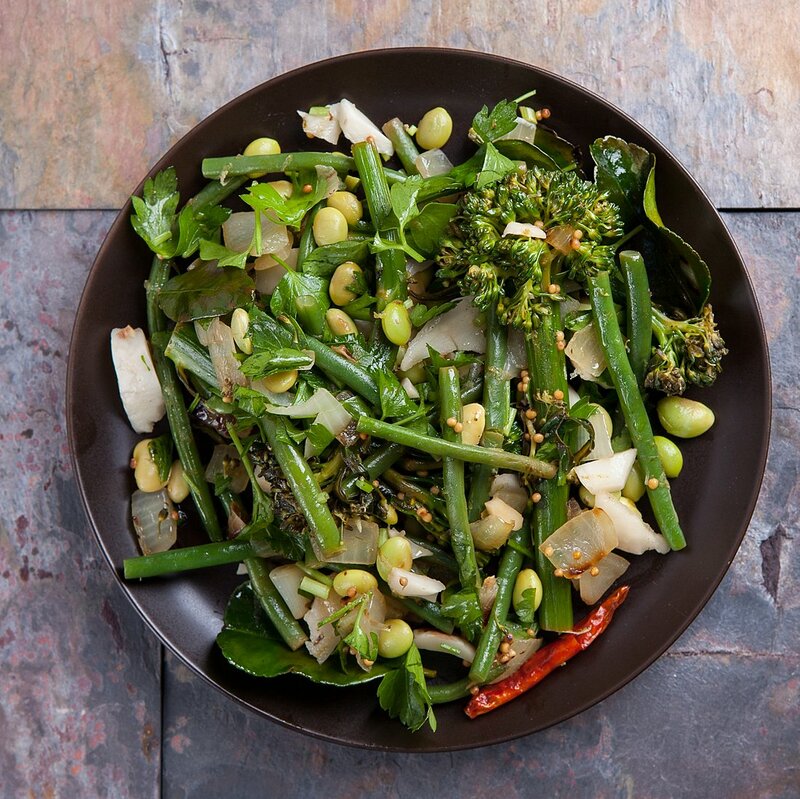 Add blanched veggies (green beans, broccolini, and edamame) to the sauté pan to combine. Cook very briefly, 1-2 minutes and remove from heat. Add coconut, cilantro and lime juice to finish. Stir gently to combine. Tangy, fresh and light with tons of lime and coconut. Take a ride around the world with this tropical vegetable dish. The Kaffir Lime leaves give an amazing aroma of lime throughout the dish without citrusy bitterness. 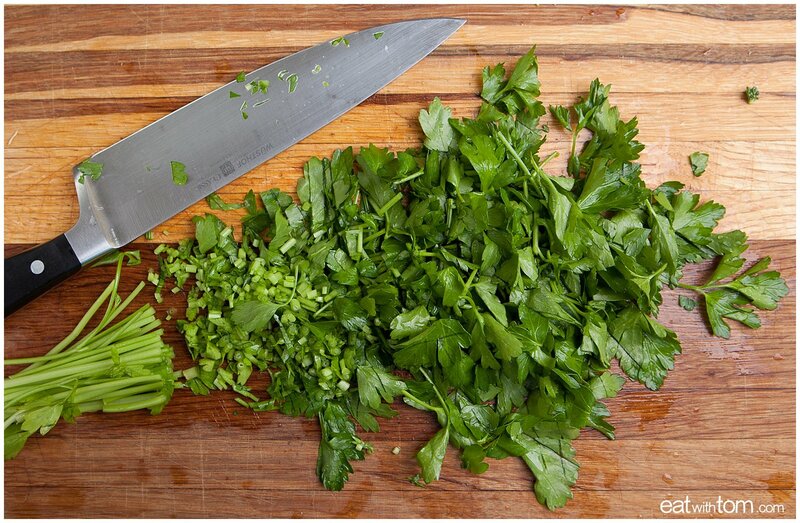 Finished with heaping handful of cilantro for an ultimate fresh taste. Put on cut-resistant gloves. With a large chef's knife, gently whack the top portion, about 1.5 inches down from the tip. Use moderate force, to chip away at the white flesh until you hit the inner woody center. Work your way around the top making 5-6 cut areas. Once the core cracks, you are almost in, be careful to not lose all of the milk. Remove top of coconut. Dump milk into a glass and enjoy. Green Beans Stir Fry with Tempeh – Vegan Dinner!